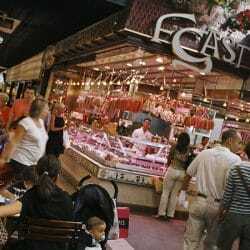 Lyon’s largest outdoor food market in the heart of the city. 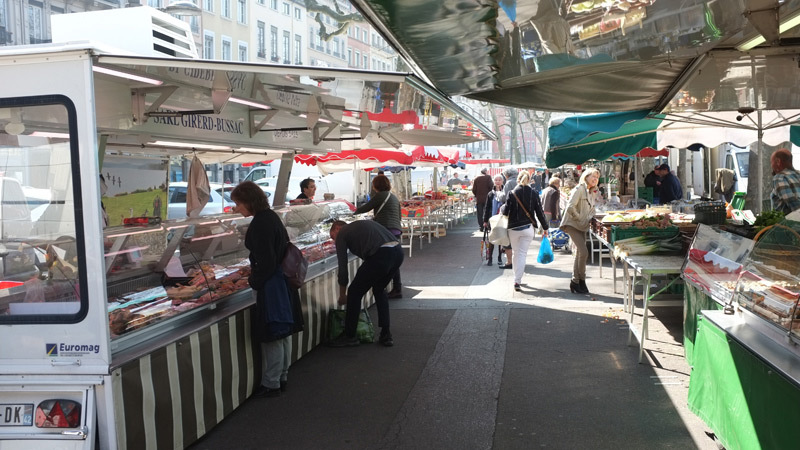 The food market of St Antoine is a great place for all your daily food shopping in the centre of Lyon on the banks of the River Saone between the bridges Bonaparte and Maréchal-Juin. Slightly smaller during the week and reaching full capacity on weekends this is one of Lyon’s most popular outdoor markets. 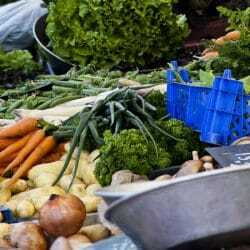 A wonderful selection of produce including, fruit, vegetables, meat, fish, poultry, cheese, bread, wine and pastries. There is a lot of regional food as well as imported produce and many vendors sell hot dishes such as spit roasted chickens and fresh pizzas and there are various Asian and North African dishes available ready to eat. There are dried fruits, grains, spices, olives, honey and many speciality items. There is perhaps slightly more emphasis on gourmet foods at the St Antoine Market as compared to Lyon’s other large outdoor market in La Croix Rousse. The market dates back to around 1910 when boats loaded with produce would arrive in Lyon and moor along the quays of the River Saone. This lively market is frequented by locals, tourists and the chefs of Lyon’s finest restaurants in search of quality ingredients for their customers. There are often on weekends around 140 vendors who come from the Rhone Valley and surrounding areas. St Antoine Market is a great place for your daily grocery shopping and one of the best places to find gourmet and speciality food items in a convenient central location. Every Monday from 6am to 1:30pm there is an on-food market featuring vendors selling all kinds of things including; clothing, jewellery, footwear, cosmetics, furniture and household items. The market is located on the Quai Saone near the Theatre des Célestins across the river from Vieux Lyon and easily reached by foot from anywhere in the centre of Lyon. The nearest metro station is Cordeliers. Parking : Quai Saint- Antoine 69002 Lyon – Place des Célestins 69002. The market can be fun for kids but it’s best to avoid using pushchairs and strollers. Come early to avoid the crowds and be sure to leave time for a drink at one of the outdoor cafés and take in a splendid view of The Basilica of Fourviere. It’s also worth taking the time to enjoy Place des Céléstins with its magnificent theatre which sits just 100 metres away. The market is open every day except Monday at 6am and closes at 1pm Tuesday, Wednesday and Thursday; 1:30pm Friday and Saturday and 2pm on a Sunday. The market can be fun for kids but it’s best to avoid using pushchairs and strollers. Les Halles de Lyon Paul Bocuse is a remarkable indoor food market offering the very finest produce available anywhere since 1859.